It's no secret that Santa Barbara loves a parade. In the summer, it seems like there's one every weekend. But by far, the most beloved and most unique parade is the one that accompanies the annual Santa Barbara Summer Solstice Celebration. 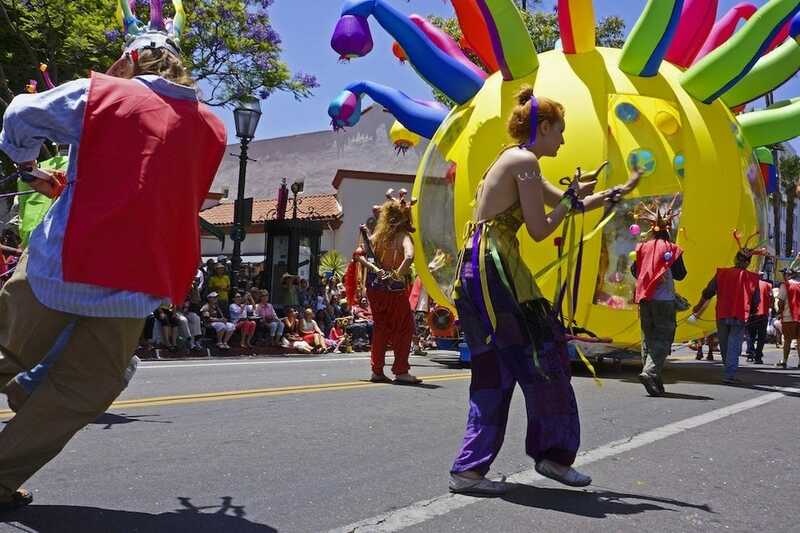 On the Saturday that's closest to the longest day of the year, Santa Barbara hosts a colorful parade that celebrates the sun and the arts. This parade and festival draws a crowd that tops 100,000 people from all corners of the world. The parade starts at noon on Saturday, and it'ss comprised of dance troupes, bands, local families and other organizations in colorful and silly costumes. There are many floats throughout the parade, including a large inflatable float by artist Pali Ex. There's a new theme each year, and participants create outfits, decorations and acts that suit the theme. The Summer Solstice Celebration parade began way back in 1974 as a birthday celebration for local artist Michael Felcher and has since grown into the largest three-day arts celebration in the area. In addition to the parade, from Friday through Sunday, there's a marketplace and festival in Alameda Park. The festival at the park includes booths for local arts and crafts vendors, as well as food vendors from around the area. There's also a beer garden and live music. A new band goes on stage almost every hour! On Saturday, the parade starts on Cota Street and closes down busy State Street for a few hours. Several participants throw things like flowers and candy into the audience as they pass. Independent vendors sell floral crowns and fairy wings throughout. At the close of the parade, many onlookers follow the last float to the festival at the park for fun and revelry. Spontaneous drum circles break out. The floats park along the edges of the festival, so you can take a closer look. If you're not in the mood for a sort of hippie-dippie, psychedelic celebration, then you can take your kids to Kids World, an epic playground at the other end of the park. Or you can change course altogether and go wine tasting in Santa Barbara's Funk Zone. If you're hungry, there are many downtown restaurants within easy walking distance of the festivities. One word of caution if you're planning to come in from out of town: Be sure you book your accommodations well in advance. 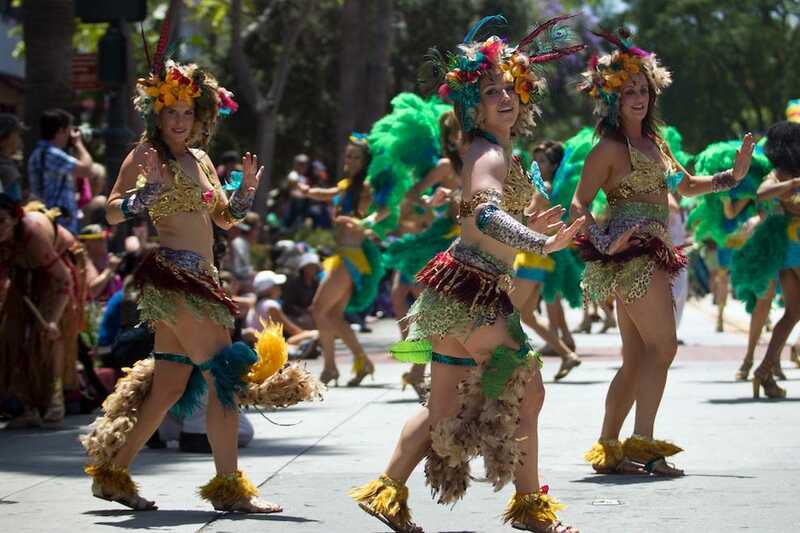 Santa Barbara hotels book up quickly during Summer Solstice Celebration. 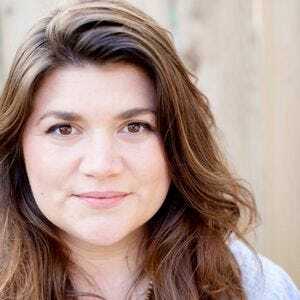 Geneva Ives is a local writer with many friends and coworkers who dance in the parade every year.